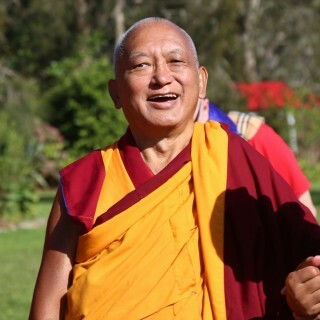 Lama Zopa Rinpoche on the way to consecrate the stupa at Mahamudra Centre, Colville, New Zealand, May 2015. More Free Books from LYWA! Lama Zopa Rinpoche with monks and Western students in the garden at Kopan Monastery after the earthquake, Nepal, April 25, 2015. 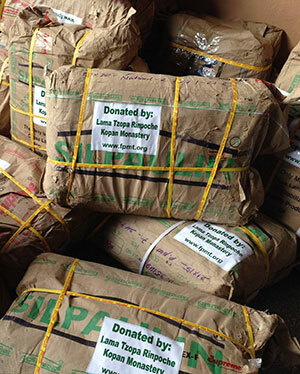 Emergency aid for Thame waiting to be flown to Lukla and then helicoptered to Thame, Nepal, May 1, 2015. Photo courtesy of Tara Melwani on Facebook. FPMT International Office offers its deepest sympathies to all the people of Nepal who have suffered due to the devastating earthquakes that struck the country in late April and again earlier this week. Many students have been and continue to be deeply concerned with the situation in Nepal following the earthquakes. We have put together a page which outlines all of the recommended prayers and practices one can do to help the situation. We’re also dedicated to facilitating help following the earthquake. The Nepal Earthquake Support Fund is offering initial aid in some of the most remote areas and helping to rebuild following damage to FPMT centers in Nepal such as Kopan Monastery, Kopan Nunnery and Lawudo. 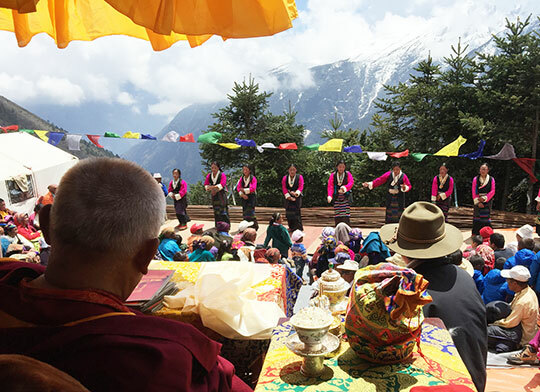 So far, the fund has disbursed US$75,000 to provide critical food and tent packages to the remote villages of Solu Khumbu, such as Thame, Lama Zopa Rinpoche’s birthplace. Lama Zopa Rinpoche in front of a Thousand-Armed Chenrezig statue, which is the main statue in the new gompa at Kopan Nunnery, Nepal, April 30, 2015. “The benefits of reciting the Compassion Buddha mantra are infinite, like the limitless sky,” Lama Zopa Rinpoche said in July 2000. 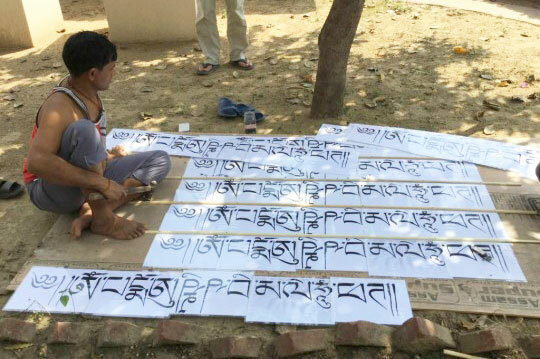 Mantras line the roof of the chicken coop at Root Institute, Bodhgaya, India, March 2015. Lama Zopa: we need to cherish the one who is causing us [the] most difficulties, see as most kind! … practice patience! 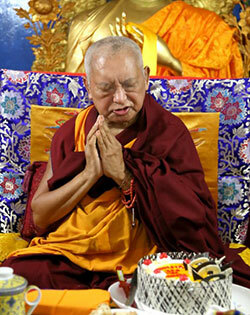 Lama Zopa Rinpoche at Root Institute, Bodhgaya, India, February 2015. Full details. Subscribe to our FPMT news blog to get updates as soon as they are announced. Rinpoche Available Now – Enjoy livestreams of the teachings below and recordings of Rinpoche’s most recent teachings! Please enjoy the new design of FPMT’s Charitable Projects! 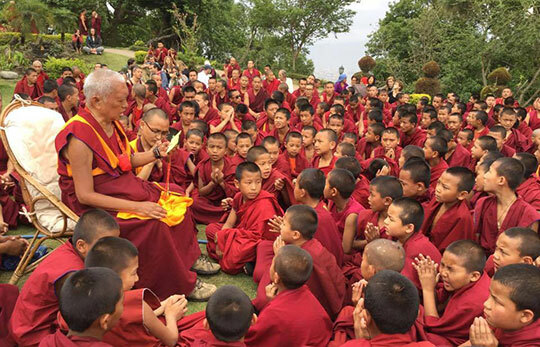 Based on Lama Zopa Rinpoche’s Vast Visions for the FPMT organization, the new project page highlights the areas Rinpoche has identified for the organization to focus on in order to benefit others, such as supporting ordained Sangha and social services. Through the Social Services Fund we were able to set up the Nepal Earthquake Support Fund in order to be able to offer urgently needed aid on the ground in some of the most remote areas in Nepal, severely damaged after the recent earthquake. Also, we’ll be able to offer ongoing support for the rebuilding of Kopan Monastery, Kopan Nunnery and Lawudo. So far, the Nepal Earthquake Support Fund has disbursed over US$75,000 to provide critical food and tent packages to the remote villages of Solu Khumbu, such as Thame, Lama Zopa Rinpoche’s birthplace. Find updates and news from Kopan Monastery and updates on how funds are being used on FPMT.org. The new, redesigned Mandala magazine will be published in June 2015 and will offer the highest quality teachings, stories, interviews and photos to instruct and inspire FPMT students. The reimagined Mandala will be a timeless and beautiful magazine that you won’t want to miss! By becoming a supporter of the Friends of FPMT program at the e-Friends level or higher by May 31, you will receive the new Mandala as soon as it is published. 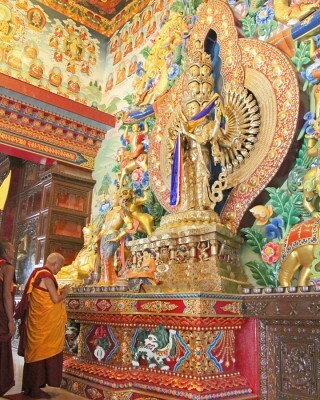 For more details on the new era of Mandala visit us online at fpmt.org/mandala. Sign up now to support the Friends of FPMT program! Le Service de traduction francophone de la FPMT a traduit en français le Rapport annuel 2014 de la FPMT “Préserver, développer et diffuser la tradition du Mahayana”. Lisez-le au format e-zine ! Sherpa women offer dance to Lama Zopa Rinpoche before Rinpoche gives the Amitabha long life initiation in front of Lawudo Gompa, Nepal, April 21, 2015. 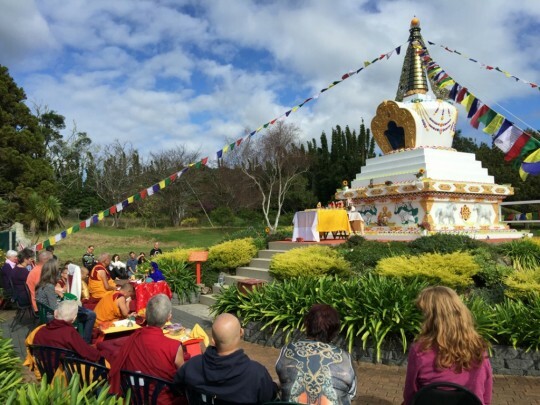 Lama Zopa Rinpoche consecrating stupa at Mahamudra Centre, New Zealand, May 2015. “I know you are the director and have to do everything and must be so busy, so I really from my heart want to highly appreciate you, all you are doing with all your body, speech and mind. I want to say billions and zillions of thanks to you for every single action of your body, speech and mind dedicated for sentient beings, for the teachings of Buddha, for His Holiness the Dalai Lama and for Mickey Mouse me. I am very small, like dahl. I hope not black dahl, but orange dahl! Lama Zopa Rinpoche created a sign for all centers, projects and services with large statues (or any center that would like this sign) to frame and place in front of the statues. The 2015 edition of Nyung Nä: The Means of Achievement of the Eleven-Face Great Compassionate One (see above) is now available through the Foundation Store. All FPMT centers, projects, services receive a 40% discount plus a PDF copy of the same title – suitable for your electronic device – for FREE! Offer valid until June 30, 2015. This promotion is valid only for FPMT centers, projects and services with a wholesale account. Lama Yeshe Wisdom Archive has just printed 30,000 more free books: Teachings from Tibet; Becoming Your Own Therapist; The Peaceful Stillness of the Silent Mind; The Essence of Tibetan Buddhism; Life, Death and After Death and Freedom Through Understanding. Freely available to all FPMT students and centers, projects and services. See the LYWA website for details. Creating Compassionate Cultures, an FDCW-associated program, recently released a new education curriculum training for use in the classroom. They encourage all educators to engage in the training for a transformational experience that leads to a happier, more meaningful, and successful life. NEW: Vajrapani Institute, USA needs an SPC and a kitchen manager; Root Institute, India has various positions including receptionist/house manager, nurses, occupational therapists, and volunteer English teachers; Chenrezig Institute, Australia has an opening for a full-time center manager; last chance to apply for the center manager position at Kadampa Center, USA; Milarepa Center, USA is looking for a cook/kitchen manager.